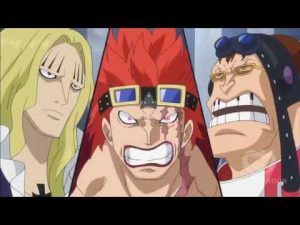 One Piece Worst Generation – The eleven supernovas war? considered a pirate of the Worst Generation, along with the eleven Supernovas. They all have bounties of over 100 million belly, and they arrived at the Sabaody Archipelago just before the start of the Marineford War. They have been called the Worst Generation, due to the fact that all the different conflicts that happened at their rookie year and after the war of the best, have to do with them. They are considered such important pirates due to their actions, that it has been said that each and every one of them, holds the potential of inspiring a whole new generation of pirates. We have already seen Bartholomeo stating that Luffy and the Straw Hats inspired him to become a pirate. They are all hated by Cavendish, because he believes they stole the spotlight from him :D.
Since the Supernovas entered the New World, they formed relationships of power between them and other important players of the mighty New World. From that, two basic pirate alliances emerged. 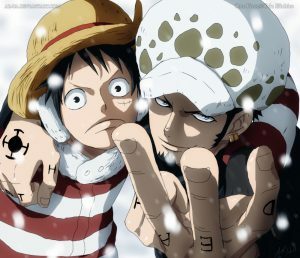 The first was the Straw Hats and Heart Pirates Alliance, between Luffy and Trafalgar Law. The other one, was an alliance between Eustass Kid, Scratchmen Apoo and Basil Hawkins. Lets call this alliance the Kid Alliance. Before we delve deeper into the motives and possible moves of each alliance, lets first briefly state what we know about the other Supernovas as of now. X-Drake, the ancient Zoan devil fruit user, appears to currently be a part of the Beast Pirates, who are under the control of the Yonkou Kaido. Capone Bege is on the other hand part of the Big Mom Pirates, the crew of the other Yonkou, Big Mom. The thing we know about Jewelry Bonney is that she somehow escaped the capture of the Marines. We don’t know anything else about her whereabouts right now. More about her can be found on our Admiral Fujitora post. Regarding Urouge, we just can point that he knows or at least has met Kaido, as he is shown beside him when he tries his suicidal fall from the Sky Island to the island where he found the Kid Alliance. More on this later. The last of the Worst Generation, Blackbeard, after defeating the remnants of the Whitebeard Pirates in the Payback War(post about that coming), is now a Yonkou himself. Lets now discuss the two Alliances’s motives and whereabouts, as well as possible ways the story could unfold. We know that Luffy and Law managed to defeat the mighty Shichibukai Donquixote Doflamingo, during the Dressrosa arc. As far as the New World is concerned, their act of defeating Doffy and destroying all the Smile factories, instantly makes them direct enemies of the Yonkou Kaido, the king of the beasts as he is known. Luffy and as a result the whole alliance, is also going to clash directly with Big Mom, due to two basic facts. The first one is that Luffy essentially picked a fight with her, in a conversation they had through the Den den Mushi, at the Dressrosa arc. The second one is that she probably has captured Sanji, Nami, Brook and Chopper, making it inevitable for Luffy to chase her down and rescue them. This alliance is also affiliated with Shanks. They don’t have an alliance officially, but we do know that Shanks is fond of Luffy, so it’s only logical that there is some kind of affiliation between them. Unless, there is something deeper and surprising lurking about Shanks. Until recently, we knew that Kid, Apoo and Hawkins had formed an alliance. Many speculations were made as to their motives and role later on in the story. Many thought they would target Shanks, thus becoming enemies with Luffy later on. Due to the latest developments with Kaido attacking and defeating them, i believe this scenario is highly unlikely now though. Moreover, the fact that before the Kaido encounter they were shinking Big Mom’s ships, shows that they were targeting her at the time. Lets mention quickly how the encounter evolved. Kaido, being the beast he is, easily defeated Eustass Kid and now he has him rotting in a prison cell of his. We don’t really know what happened with Basil Hawkins, he either evaded the capture, or is also in a prison cell, though i believe the first is what happened. 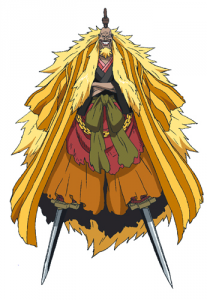 Regarding Scratchmen Apoo, it appears that he became a subordinate of Kaido, essentially betraying his former alliance. The thing is that the Kid Alliance right now, basically doesn’t exist. So, the question arises, how will the story unfold from here on out? The only Supernova which isn’t a captain other than Zoro, is Eustass Kid’s swordsman Killer. We didn’t see him getting captured, so it is safe to assume that he could have evaded Kaido as well. What are going to be his next moves? Killer probably wants to rescue his captain, so how could he do that? It is quite possible that Killer, in his desperation will seek Luffy’s help. Because though the Zoro-Law group is heading to Wano Kingdom, it might be easier for him to reach out to them, since they are closer to him. That could lead to a Luffy-Law-Kid alliance, which was foreshadowed when they teamed up at the Sabaody Archipelago, in order to evade the Marines, the Pacifista and Admiral Kizaru. This whole development could lead to two rescue arcs, which may unfold simultaneously. The Luffy group clashing with Big Mom, trying to rescue the Sanji group, and the Law-Zoro-Killer group going against Kaido, in order to rescue Eustass Kid. Because this would be overwhelming for the alliance, i don’t really see it happening that way at the same time. It seems almost inevitable that a big war will happen sometime soon in One Piece. This war will give the Supernovas the chance to bring imbalance to the New World, thus making the overthrow of the Yonkou much more possible. The start of the war will come from Kaido himself, as it has been obviously foreshadowed in the latest chapters. The other Yonkou will participate in the war as well. Blackbeard will participate probably for the opportunity of gaining new devil fruits and territories, and Big Mom because she has beef with Luffy, as well as the Kid Alliance. Regarding Shanks, i believe he will just be forced to enter the war, either because he will be targeted or because he would want to aid Luffy maybe. It is certain that the Marines will take part in the war. We all know the opportunist Akainu is, and this is a big opportunity. The whole pirate world will be engulfed in the war, with the Yonkou facing each other and many other threats, like the Supernovas. Wouldn’t that be the best chance for him to find them vulnerable and claim new territories in the New World? After all, that’s why he moved the Navy Headquarters there. The end of One Piece? I don’t really believe this war will signal the end of One Piece though. It will just bring new balances to the New World and shake everyone up. The old pirate world will perish, and the reign of the new top rookies, the Worst Generation will be established. We won’t yet have a Pirate King though. After all, Luffy is just 19. Most probably, after the War a second timeskip will happen, which will lead in the final development of the main characters. After that, the final clash with the World Government will begin, along with the battle for the Pirate King title and the race to One Piece. All that will lead to the explanation of the Void Century and the Will of the D.
There are some more interesting characters that could have some role in the war. The revolutionaries are a mystery, though i believe they won’t play a major role, as Oda will keep them for the last arc. Gekko Moriah who has a grudge against Kaido, as well as Crocodile will probably participate. 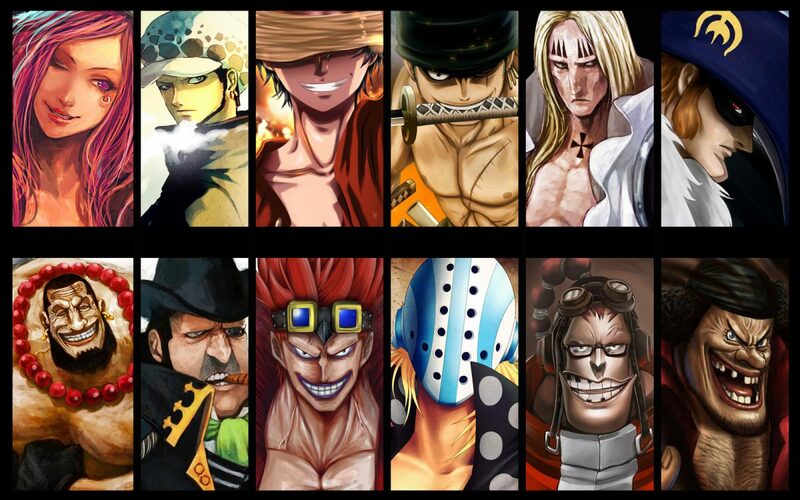 The remnants of the Whitebeards will probably join the alliance of Luffy. Golden Lion Shiki is also a possible pirate to take part, and maybe become a Yonkou after the War, or just be able to unleash his rage upon the new age he despises. The end of the war will probably result in a chaos. I don’t believe the One Piece Worst Generation will emerge victorious, thus the need for a new timeskip. So, what do you think about the eleven supernovas and the new age of pirates? Share in the comments below and like our facebook page for updates(click to the right come on :P). p.s. also, check out our updated recommendations page :). 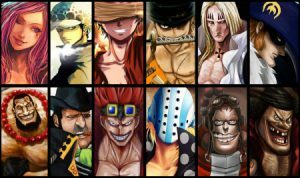 Very interesting take on the one piece worst generation and the 11 SuperNovas – Pirate Alliances and the end of the war ending in Chaos – Thank you for sharing and I love the graphics that go along with the post as they bring to life the adventure and alliances that you write about! Man, your article really brought back some memories when I first started reading Once Piece in the Shounen Jumps. I never caught on with it and stopped very early on (Like Luffy rescuing Zorro early). I read through some of the article but didn’t want to spoil it for myself cuz I really do want to pick it back up. I’ve only heard good things about it. I’m assuming you’re a naruto fan too from your gravatar name? What do you think of the new Boruto series so far? Previous Previous post: Cipher Pol One Piece – Who are they? Next Next post: One Piece Pirate Warriors 3 Ps4 Review – Worth it?